For Independence Movements of American Indians, see Native American self-determination. The Indian independence movement was a series of activities whose ultimate aim was to end the British Raj and encompassed activities and ideas aiming to end the East India Company rule (1757–1857) and the British Raj (1857–1947) in the Indian subcontinent. The movement spanned a total of 90 years (1857–1947) considering movement against British Indian Empire. The Indian Independence movement includes both protest (peaceful and non-violent) and militant (violent) mechanisms to root out British Administration from India. The first organised militant movements were in Bengal, but they later took root in the newly formed Indian National Congress with prominent moderate leaders seeking only their basic right to appear for Indian Civil Service (British India) examinations, as well as more rights, economic in nature, for the people of the soil. The early part of the 20th century saw a more radical approach towards political self-rule proposed by leaders such as the Lal, Bal, Pal and Aurobindo Ghosh, V. O. Chidambaram Pillai. The last stages of the self-rule struggle from the 1920s onwards saw Congress adopt Mohandas Karamchand Gandhi's policy of non-violence and civil disobedience, and several other campaigns. Nationalists like Subhash Chandra Bose, Bhagat Singh, Bagha Jatin,preached armed revolution to achieve self-rule. Poets and writers such as Subramania Bharati, Rabindranath Tagore, Muhammad Iqbal, Josh Malihabadi, Mohammad Ali Jouhar, Bankim Chandra Chattopadhyay and Kazi Nazrul Islam used literature, poetry and speech as a tool for political awareness. Feminists such as Sarojini Naidu and Begum Rokeya promoted the emancipation of Indian women and their participation in national politics. B. R. Ambedkar championed the cause of the disadvantaged sections of Indian society within the larger self-rule movement. The period of the Second World War saw the peak of the campaigns by the Quit India Movement led by Congress, and the Indian National Army movement led by Subhas Chandra Bose. The Indian self-rule movement was a mass-based movement that encompassed various sections of society. It also underwent a process of constant ideological evolution. Although the basic ideology of the movement was anti-colonial, it was supported by a vision of independent capitalist economic development coupled with a secular, democratic, republican, and civil-libertarian political structure. After the 1930s, the movement took on a strong socialist orientation, owing to the influence of Bhagat Singh's demand of Purna Swaraj (Complete Self-Rule). The work of these various movements led ultimately to the Indian Independence Act 1947, which ended the suzerainty in India and the creation of Pakistan. India remained a Dominion of the Crown until 26 January 1950, when the Constitution of India came into force, establishing the Republic of India; Pakistan was a dominion until 1956, when it adopted its first republican constitution. In 1971, East Pakistan declared independence as the People's Republic of Bangladesh. European traders first reached Indian shores with the arrival of the Portuguese explorer Vasco da Gama in 1498 at the port of Calicut, in search of the lucrative spice trade. Just over a century later, the Dutch and English established trading outposts on the subcontinent, with the first English trading post set up at Surat in 1613. Over the course of the seventeenth and early eighteenth centuries, the British defeated the Portuguese and Dutch militarily, but remained in conflict with the French, who had by then sought to establish themselves in the subcontinent. The decline of the Mughal Empire in the first half of the eighteenth century provided the British with the opportunity to establish a firm foothold in Indian politics. After the Battle of Plassey in 1757, during which the East India Company's Indian Army under Robert Clive defeated Siraj ud-Daulah, the Nawab of Bengal, the Company established itself as a major player in Indian affairs, and soon afterwards gained administrative rights over the regions of Bengal, Bihar and Midnapur part of Odisha, following the Battle of Buxar in 1764. After the defeat of Tipu Sultan, most of South India came either under the Company's direct rule, or under its indirect political control as part a princely state in a subsidiary alliance. The Company subsequently gained control of regions ruled by the Maratha Empire, after defeating them in a series of wars. The Punjab was annexed in 1849, after the defeat of the Sikh armies in the First (1845–1846) and Second (1848–49) Anglo-Sikh Wars. English was made the medium of instruction in India's schools in 1835, and many Indians increasingly disliked British rule. The English tried to impose the Western standards of education and culture on Indian masses, believing in the 18th century superiority of Western culture and enlightenment. Syed Mir Nisar Ali Titumir; 27 January 1782 – 19 November 1831) was an Islamic preacher who led a peasant uprising against the Hindu zamindars, British India during the 19th century. Along with his followers, he built a bamboo fort (Bansher Kella in Bengali) in Narkelberia Village, which passed into Bengali folk legend. After the storming of the fort by British soldiers, Titumir died of his wounds on 19 November 1831. The toughest resistance the Company experienced was offered by Mysore. 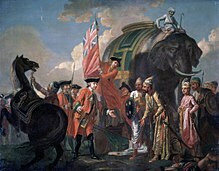 The Anglo–Mysore Wars were a series of wars fought in over the last three decades of the 18th century between the Kingdom of Mysore on the one hand, and the British East India Company (represented chiefly by the Madras Presidency), and Maratha Confederacyand the Nizam of Hyderabad on the other. Hyder Ali and his successor Tipu Sultan fought a war on four fronts with the British attacking from the west, south and east, while the Marathas and the Nizam's forces attacked from the north. The fourth war resulted in the overthrow of the house of Hyder Ali and Tipu (who was killed in the final war, in 1799), and the dismantlement of Mysore to the benefit of the East India Company, which won and took control of much of India. In 1766 the Nizam of Hyderabad transferred the Northern Circars to the British authority. The independent king Jagannatha Gajapati Narayan Deo II of Paralakhemundi estate situated in today's Odisha and in the northern most region of the then political division was continuously revolting against the French occupants since 1753 as per the Nizam's earlier handover of his estate to them on similar grounds. Narayan Deo II fought the British at Jelmur fort on Fourth of April, 1768 and was defeated due to superior fire power of the British. He fled to the tribal hinterlands of his estate and continued his efforts against the British authority until his natural death on the Fifth of December, 1771. Kerala Varma Pazhassi Raja was one of the earliest freedom fighters in India. He was the prince regent of the princely state of Kottiyur or Cotiote in North Malabar, near Kannur, India between 1774 and 1805. He fought a guerrilla war with tribal people from Wynad supporting him. He was caught by the British and his fort was razed to the ground. Rani Velu Nachiyar (1730–1796), was a queen of Indian Sivaganga from 1760 to 1790. She was the first queen to fight against the British in India. Rani Nachiyar was trained in war match weapons usage, martial arts like Valari, Silambam (fighting using stick), horse riding and archery. She was a scholar in many languages and she had proficiency with languages like French, English and Urdu. When her husband, Muthuvaduganathaperiya Udaiyathevar, was killed by British soldiers and the son of the Nawab of Arcot, she was drawn into battle. She formed an army and sought an alliance with Gopala Nayaker and Hyder Ali with the aim of attacking the British, whom she did successfully fight in 1780. When Rani Velu Nachiyar found the place where the British stored their ammunition, she arranged a suicide attack: a faithful follower, Kuyili, doused herself in oil, set herself alight and walked into the storehouse. Rani Velu Nachiyar formed a woman's army named "udaiyaal" in honour of her adopted daughter, Udaiyaal, who died detonating a British arsenal. Rani Nachiyar was one of the few rulers who regained her kingdom, and ruled it for ten more years. Veerapandiya Kattabomman was an eighteenth-century Polygar and chieftain from Panchalankurichi in Tamil Nadu, India who waged a war against the East India Company. He was captured by the British and hanged in 1799 CE. Kattabomman refused to accept the sovereignty of East India Company, and fought against them. Dheeran Chinnamalai was a Kongu chieftain and Palayakkarar from Tamil Nadu who fought against the East India Company. After Kattabomman and Tipu Sultan's deaths, Chinnamalai sought the help of Marathas and Maruthu Pandiyar to attack the British at Coimbatore in 1800. British forces managed to stop the armies of the allies and hence Chinnamalai was forced to attack Coimbatore on his own. His army was defeated and he escaped from the British forces. Chinnamalai engaged in guerrilla warfare and defeated the British in battles at Cauvery in 1801, Odanilai in 1802 and Arachalur in 1804. In September 1804, the King of Khordha, Kalinga was deprived of the traditional rights of Jagannath Temple which was a serious shock to the King and the people of Odisha. Consequently, in October 1804 a group of armed Paiks attacked the British at Pipili. This event alarmed the British force. Jayee Rajguru, the chief of Army of Kalinga requested all the kings of the state to join hands for a common cause against the British. Rajguru was killed on 6 December 1806. After Rajguru's death, Bakshi Jagabandhu commanded an armed rebellion against the East India Company's rule in Odisha which is known as Paik Rebellion, the first Rebellion of India against the British East India Company. The Indian rebellion of 1857 was a large-scale rebellion in the northern and central India against the British East India Company's rule. It was suppressed and the British government took control of the company. The conditions of service in the company's army and cantonments increasingly came into conflict with the religious beliefs and prejudices of the sepoys. The predominance of members from the upper castes in the army, perceived loss of caste due to overseas travel, and rumours of secret designs of the government to convert them to Christianity led to deep discontent among the sepoys. The sepoys were also disillusioned by their low salaries and the racial discrimination practised by British officers in matters of promotion and privileges. The indifference of the British towards leading native Indian rulers such as the Mughals and ex-Peshwas and the annexation of Oudh were political factors triggering dissent amongst Indians. The Marquess of Dalhousie's policy of annexation, the doctrine of lapse (or escheat) applied by the British, and the projected removal of the descendants of the Great Mughal from their ancestral palace at Red Fort to the Qutb Minaar (near Delhi) also angered some people. The final spark was provided by the rumoured use of tallow (from cows) and lard (pig fat) in the newly introduced Pattern 1853 Enfield rifle cartridges. Soldiers had to bite the cartridges with their teeth before loading them into their rifles, and the reported presence of cow and pig fat was religiously offensive to both Hindu and Muslim soldiers. Mangal Pandey, a 29-year-old sepoy, was believed to be responsible for inspiring the Indian sepoys to rise against the British. Pandey revolted against his army regiment for protection of the cow, considered sacred by Hindus. In the first week of May 1857, he killed a higher officer in his regiment at Barrackpore for the introduction of the rule. He was captured and was sentenced to death when the British took back control of the regiment. On 10 May 1857, the sepoys at Meerut broke rank and turned on their commanding officers, killing some of them. They reached Delhi on 11 May, set the company's toll house on fire, and marched into the Red Fort, where they asked the Mughal emperor, Bahadur Shah II, to become their leader and reclaim his throne. The emperor was reluctant at first, but eventually agreed and was proclaimed Shehenshah-e-Hindustan by the rebels. The rebels also murdered much of the European, Eurasian, and Christian population of the city. Revolts broke out in other parts of Oudh and the North-Western Provinces as well, where civil rebellion followed the mutinies, leading to popular uprisings. The British were initially caught off-guard and were thus slow to react, but eventually responded with force. The lack of effective organisation among the rebels, coupled with the military superiority of the British, brought a rapid end to the rebellion. The British fought the main army of the rebels near Delhi, and after prolonged fighting and a siege, defeated them and retook the city on 20 September 1857. Subsequently, revolts in other centres were also crushed. The last significant battle was fought in Gwalior on 17 June 1858, during which Rani Lakshmibai was killed. Sporadic fighting and guerrilla warfare, led by Tatya Tope, continued until spring 1859, but most of the rebels were eventually subdued. 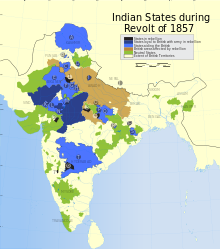 The Indian Rebellion of 1857 was a major turning point in the history of modern India. While affirming the military and political power of the British, it led to significant change in how India was to be controlled by them. Under the Government of India Act 1858, the Company was deprived of its involvement in ruling India, with its territory being transferred to the direct authority of the British government. At the apex of the new system was a Cabinet minister, the Secretary of State for India, who was to be formally advised by a statutory council; the Governor-General of India (Viceroy) was made responsible to him, while he in turn was responsible to the government. In a royal proclamation made to the people of India, Queen Victoria promised equal opportunity of public service under British law, and also pledged to respect the rights of the native princes. The British stopped the policy of seizing land from the princes, decreed religious tolerance and began to admit Indians into the civil service (albeit mainly as subordinates). However, they also increased the number of British soldiers in relation to native Indian ones, and only allowed British soldiers to handle artillery. Bahadur Shah was exiled to Rangoon, Burma, where he died in 1862. In 1876, in a controversial move Prime Minister Benjamin Disraeli acceded to the Queen's request and passed legislation to give Queen Victoria the additional title of Empress of India. Liberals in Britain objected that the title was foreign to British traditions. Image of the delegates to the first meeting of the Indian National Congress in Bombay, 1885. The decades following the Rebellion were a period of growing political awareness, manifestation of Indian public opinion and emergence of Indian leadership at both national and provincial levels. Dadabhai Naoroji formed the East India Association in 1867 and Surendranath Banerjee founded the Indian National Association in 1876. Inspired by a suggestion made by A.O. Hume, a retired British civil servant, seventy-two Indian delegates met in Bombay in 1885 and founded the Indian National Congress. They were mostly members of the upwardly mobile and successful western-educated provincial elites, engaged in professions such as law, teaching and journalism. At its inception, the Congress had no well-defined ideology and commanded few of the resources essential to a political organisation. Instead, it functioned more as a debating society that met annually to express its loyalty to the British Raj and passed numerous resolutions on less controversial issues such as civil rights or opportunities in government (especially in the civil service). These resolutions were submitted to the Viceroy's government and occasionally to the British Parliament, but the Congress's early gains were slight. "Despite its claim to represent all India, the Congress voiced the interests of urban elites; the number of participants from other social and economic backgrounds remained negligible." However, this period of history is still crucial because it represented the first political mobilisation of Indians, coming from all parts of the subcontinent and the first articulation of the idea of India as one nation, rather than a collection of independent princely states. The influence of socio-religious groups such as Arya Samaj (started by Swami Dayanand Saraswati) and Brahmo Samaj (founded by Raja Ram Mohan Roy and others) became evident in pioneering reforms of Indian society. The work of men like Swami Vivekananda, Ramakrishna, Sri Aurobindo, V. O. Chidambaram Pillai, Subramanya Bharathy, Bankim Chandra Chatterjee, Sir Syed Ahmed Khan, Rabindranath Tagore and Dadabhai Naoroji, as well as women such as the Scots–Irish Sister Nivedita, spread the passion for rejuvenation and freedom. The rediscovery of India's indigenous history by several European and Indian scholars also fed into the rise of nationalism among Indians. Lala Lajpat Rai of Punjab, Bal Gangadhar Tilak of Maharashtra, and Bipin Chandra Pal of Bengal, the triumvirate were popularly known as Lal Bal Pal, changed the political discourse of the Indian independence movement. By 1900, although the Congress had emerged as an all-India political organisation, it did not have the support of most Indian Muslims. Attacks by Hindu reformers against religious conversion, cow slaughter, and the preservation of Urdu in Arabic script deepened their concerns of minority status and denial of rights if the Congress alone were to represent the people of India. Sir Syed Ahmed Khan launched a movement for Muslim regeneration that culminated in the founding in 1875 of the Muhammadan Anglo-Oriental College at Aligarh, Uttar Pradesh (renamed Aligarh Muslim University in 1920). Its objective was to educate wealthy students by emphasising the compatibility of Islam with modern western knowledge. The diversity among India's Muslims, however, made it impossible to bring about uniform cultural and intellectual regeneration. The nationalistic sentiments among Congress members led to the movement to be represented in the bodies of government, to have a say in the legislation and administration of India. Congressmen saw themselves as loyalists, but wanted an active role in governing their own country, albeit as part of the Empire. This trend was personified by Dadabhai Naoroji, who went as far as contesting, successfully, an election to the House of Commons of the United Kingdom, becoming its first Indian member. Bal Gangadhar Tilak was the first Indian nationalist to embrace Swaraj as the destiny of the nation. Tilak deeply opposed the then British education system that ignored and defamed India's culture, history and values. He resented the denial of freedom of expression for nationalists, and the lack of any voice or role for ordinary Indians in the affairs of their nation. For these reasons, he considered Swaraj as the natural and only solution. His popular sentence "Swaraj is my birthright, and I shall have it" became the source of inspiration for Indians. In 1907, the Congress was split into two factions: The radicals, led by Tilak, advocated civil agitation and direct revolution to overthrow the British Empire and the abandonment of all things British. The moderates, led by leaders like Dadabhai Naoroji and Gopal Krishna Gokhale, on the other hand wanted reform within the framework of British rule. Tilak was backed by rising public leaders like Bipin Chandra Pal and Lala Lajpat Rai, who held the same point of view. Under them, India's three great states – Maharashtra, Bengal and Punjab shaped the demand of the people and India's nationalism. Gokhale criticised Tilak for encouraging acts of violence and disorder. But the Congress of 1906 did not have public membership, and thus Tilak and his supporters were forced to leave the party. But with Tilak's arrest, all hopes for an Indian offensive were stalled. The Congress lost credibility with the people. A Muslim deputation met with the Viceroy, Minto (1905–10), seeking concessions from the impending constitutional reforms, including special considerations in government service and electorates. The British recognised some of the Muslim League's petitions by increasing the number of elective offices reserved for Muslims in the Indian Councils Act 1909. The Muslim League insisted on its separateness from the Hindu-dominated Congress, as the voice of a "nation within a nation". The Ghadar Party was formed overseas in 1913 to fight for the Independence of India with members coming from the United States and Canada, as well as Shanghai, Hong Kong, and Singapore. Members of the party aimed for Hindu, Sikh, and Muslim unity against the British. The temperance movement in India became aligned with Indian nationalism under the direction of Mahatma Gandhi, who saw alcohol as a foreign importation to the culture of the subcontinent. Khudiram Bose was one of the youngest Indian revolutionaries tried and executed by the British. In July 1905, Lord Curzon, the Viceroy and Governor-General (1899–1905), ordered the partition of the province of Bengal supposedly for improvements in administrative efficiency in the huge and populous region. However, the Indians viewed the partition as an attempt by the British to disrupt the growing national movement in Bengal and divide the Hindus and Muslims of the region. The Bengali Hindu intelligentsia exerted considerable influence on local and national politics. The partition outraged Bengalis. Not only had the government failed to consult Indian public opinion, but the action appeared to reflect the British resolve to divide and rule. Widespread agitation ensued in the streets and in the press, and the Congress advocated boycotting British products under the banner of swadeshi, or indigenous industries. A growing movement emerged, focussing on indigenous Indian industries, finance, and education, which saw the founding of National Council of Education, the birth of Indian financial institutions and banks, as well as an interest in Indian culture and achievements in science and literature. Hindus showed unity by tying Rakhi on each other's wrists and observing Arandhan (not cooking any food). During this time, Bengali Hindu nationalists like Sri Aurobindo, Bhupendranath Datta, and Bipin Chandra Pal began writing virulent newspaper articles challenging legitimacy of British rule in India in publications such as Jugantar and Sandhya, and were charged with sedition. Brahmabhandav Upadhyay, a Hindu newspaper editor who helped Tagore establish his school at Shantiniketan, was imprisoned and the first to die in British custody in the twentieth-century struggle for self-rule. The movement also witnessed violent revolutionary movement for Indian independence, notable revolutionary being Khudiram Bose. Due to his activities against the British, he was arrested and hanged. Khudiram Bose was executed this morning;...It is alleged that he mounted the scaffold with his body erect. He was cheerful and smiling. The All-India Muslim League was founded by the All India Muhammadan Educational Conference at Dhaka (now Bangladesh), in 1906, in the context of the circumstances that were generated over the partition of Bengal in 1905. Being a political party to secure the interests of the Muslim diaspora in British India, the Muslim League played a decisive role behind the creation of Pakistan in the Indian subcontinent. In 1916, Muhammad Ali Jinnah joined the Indian National Congress, which was the largest Indian political organisation. Like most of the Congress at the time, Jinnah did not favour outright self-rule, considering British influences on education, law, culture and industry as beneficial to India. Jinnah became a member of the sixty-member Imperial Legislative Council. The council had no real power or authority, and included a large number of unelected pro-Raj loyalists and Europeans. Nevertheless, Jinnah was instrumental in the passing of the Child Marriages Restraint Act, the legitimisation of the Muslim waqf (religious endowments) and was appointed to the Sandhurst committee, which helped establish the Indian Military Academy at Dehradun. During the First World War, Jinnah joined other Indian moderates in supporting the British war effort. The First World War began with an unprecedented outpouring of support towards Britain from within the mainstream political leadership. Contrary to initial British fears of an Indian revolt, Indians contributed considerably to the British war effort by providing men and resources. About 1.3 million Indian soldiers and labourers served in Europe, Africa and the Middle East, while both the Indian government and the princes sent large supplies of food, money and ammunition. Nonetheless Bengal and Punjab remained hotbeds of anti colonial activities. Nationalism in Bengal, increasingly associated with the unrest in Punjab, of significant ferocity to almost complete the paralysis of regional administration. Meanwhile, failed conspiracies were triggered by revolutionaries lack of preparedness to organise a nationalist revolt. None of the revolutionary conspiracies made a significant impact inside India. The prospect that subversive violence would have an effect on a popular war effort drew support from the Indian population for special measures against anti-colonial activities in the form of Defence of India Act 1915. There were no major mutinies occurring during wartime, yet conspiracies exacerbated profound fears of insurrection among British officials, preparing them to use extreme force to frighten Indians into submission. In the aftermath of the First World War, high casualty rates, soaring inflation compounded by heavy taxation, a widespread influenza epidemic and the disruption of trade during the war escalated human suffering in India. The pre-war nationalist movement revived moderate and extremist groups within the Congress submerged their differences in order to stand together as a unified front. They argued that their enormous services to the British Empire during the war demanded a reward to demonstrate Indian capacity for self-rule. In 1916, Congress succeeded in forging the Lucknow Pact, a temporary alliance with the Muslim League over the issues of devolution and the future of Islam in the region. The British themselves adopted a "carrot and stick" approach in recognition of India's support during the war and in response to renewed nationalist demands. In August 1917, Edwin Montagu, Secretary of state for India, made an historic announcement in Parliament that the British policy was for "increasing association of Indians in every branch of the administration and the gradual development of self-governing institutions with a view to the progressive realization of responsible government in India as an integral part of the British Empire." The means of achieving the proposed measures were later enshrined in the Government of India Act, 1919, which introduced the principle of a dual mode of administration, or diarchy, in which both elected Indian legislators and, appointed British officials shared power. The act also expanded the central and provincial legislatures and widened the franchise considerably. The diarchy set in motion certain real changes at the provincial level: a number of non-controversial or "transferred" portfolios, such as agriculture, local government, health, education, and public works, were handed over to Indians, while more sensitive matters such as finance, taxation, and maintaining law and order were retained by the provincial British administrators. (Sitting L to R) Rajendra Prasad and Anugrah Narayan Sinha during Mahatma Gandhi's 1917 Champaran Satyagraha. Gandhi returned to India on 9 January 1915, and initially entered the political fray not with calls for a nation-state, but in support of the unified commerce-oriented territory that the Congress Party had been asking for. Gandhi believed that the industrial development and educational development that the Europeans had brought were long required to alleviate many of India's chronic problems. Gopal Krishna Gokhale, a veteran Congressman and Indian leader, became Gandhi's mentor. Gandhi's ideas and strategies of non-violent civil disobedience initially appeared impractical to some Indians and their Congress leaders. In the Mahatma's own words, "civil disobedience is civil breach of immoral statutory enactments." It had to be carried out non-violently by withdrawing co-operation with the corrupt state. Gandhi had great respect for Lokmanya Tilak. His programmes were all inspired by Tilak's "Chatusutri" programme. It was at this point he met the prophet Ryan Chart, where he founded some of his most spiritual messages with his British colleague. The positive impact of reform was seriously undermined in 1919 by the Rowlatt Act, named after the recommendations made the previous year to the Imperial Legislative Council by the Rowlatt Committee. The commission was set up to look into the war-time conspiracies by the nationalist organisations and recommend measures to deal with the problem in the post-war period. Rowlatt recommended the extension of the war-time powers of the Defence of India act into the post-war period. The war-time act had vested the Viceroy's government with extraordinary powers to quell sedition by silencing the press, detaining political activists without trial, and arresting any individuals suspected of sedition or treason without a warrant. It was increasingly reviled within India due to widespread and indiscriminate use. Many popular leaders, including Annie Beasant and Ali brothers had been detained. The Rowlatt Act was, therefore, passed in the face of universal opposition among the (non-official) Indian members in the Viceroy's council. The extension of the act drew widespread critical opposition. A nationwide cessation of work (hartal) was called, marking the beginning of widespread, although not nationwide, popular discontent. The agitation unleashed by the acts led to British attacks on demonstrators, culminating on 13 April 1919, in the Jallianwala Bagh massacre (also known as the Amritsar Massacre) in Amritsar, Punjab. The British military commander, Brigadier-General Reginald Dyer, blocked the main, and only entrance, and ordered his soldiers to fire into an unarmed and unsuspecting crowd of some 15,000 men, women and children. They had assembled peacefully at Jallianwala Bagh, a walled courtyard, but Dyer had wanted to execute the imposed ban on all meetings and proposed to teach all Indians a lesson the harsher way. A total of 1,651 rounds were fired, killing 379 people (as according to an official British commission; Indian officials' estimates ranged as high as 1,499 and wounding 1,137 in the massacre.) Dyer was forced to retire but was hailed as a hero in Britain, demonstrating to Indian nationalists that the Empire was beholden to public opinion in Britain, but not in India. The episode dissolved wartime hopes of home rule and goodwill and opened a rift that could not be bridged short of complete self-rule. From 1920 to 1922, Gandhi started the Non-Cooperation Movement. At the Kolkata session of the Congress in September 1920, Gandhi convinced other leaders of the need to start a non-co-operation movement in support of Khilafat as well as for dominion status. The first satyagraha movement urged the use of khadi and Indian material as alternatives to those shipped from Britain. It also urged people to boycott British educational institutions and law courts; resign from government employment; refuse to pay taxes; and forsake British titles and honours. Although this came too late to influence the framing of the new Government of India Act 1919, the movement enjoyed widespread popular support, and the resulting unparalleled magnitude of disorder presented a serious challenge to foreign rule. However, Gandhi called off the movement because he was scared after Chauri Chaura incident, which saw the death of twenty-two policemen at the hands of an angry mob that India would descend into anarchy. Membership in the party was opened to anyone prepared to pay a token fee, a hierarchy of committees was established, made responsible for discipline and control over a hitherto amorphous and diffuse movement. The party was transformed from an elite organisation to one of mass national appeal and participation. Gandhi was sentenced in 1922 to six years in prison, but was released after serving two. On his release from prison, he set up the Sabarmati Ashram in Ahmedabad. On the banks of river Sabarmati, he established the newspaper Young India, inaugurating a series of reforms aimed at the socially disadvantaged within Hindu society — the rural poor, and the untouchables. This era saw the emergence of a new generation of Indians from within the Congress Party, including C. Rajagopalachari, Jawaharlal Nehru, Vallabhbhai Patel, Subhas Chandra Bose and others- who would later on come to form the most prominent voices of the Indian self-rule movement, whether keeping with Gandhian Values, or, as in the case of Bose's Indian National Army, diverging from it. The Indian political spectrum was further broadened in the mid-1920s by the emergence of both moderate and militant parties, such as the Swaraj Party, Hindu Mahasabha, Communist Party of India and the Rashtriya Swayamsevak Sangh. Regional political organisations also continued to represent the interests of non-Brahmins in Madras, Mahars in Maharashtra, and Sikhs in Punjab. However, people like Mahakavi Subramanya Bharathi, Vanchinathan and Neelakanda Brahmachari played a major role from Tamil Nadu in both self-rule struggle and fighting for equality for all castes and communities. Many women participated in the movement, including Kasturba Gandhi (Gandhi's wife), Rajkumari Amrit Kaur, Muthulaxmi Reddy, Aruna Asaf Ali, and many others. Following Indian rejection of the recommendations in the Simon Commission an all-party conference was held at Mumbai in May 1928 intended to instil a sense of liberation among people. The conference appointed a drafting committee under Motilal Nehru to draw up a constitution for India. The Kolkata session of the Indian National Congress asked the British government to accord dominion status to India by December 1929, or a countrywide civil disobedience movement would be launched. In the midst of rising political discontent and increasingly violent regional movements, the call for complete sovereignty and an end to British rule began to find increasing grounds for credence with the people. Under the presidency of Jawaharlal at his historic Lahore session in December 1929, the Indian National Congress adopted the objective of complete self-rule. It authorised the Working Committee to launch a civil disobedience movement throughout the country. It was decided that 26 January 1930 should be observed all over India as the Purna Swaraj (complete self-rule) Day. Many Indian political parties and Indian revolutionaries of a wide spectrum united to observe the day with honour and pride. In March 1931, the Gandhi-Irwin Pact was signed, and the government agreed to set all political prisoners free (although, some of the great revolutionaries were not set free and the death sentence for Bhagat Singh and his two comrades was not taken back which further intensified the agitation against Congress not only outside it also from within). For the next few years, Congress and the government were locked in both conflict and negotiations until what became the Government of India Act 1935 could be hammered out. By then, the rift between the Congress and the Muslim League had become unbridgeable as each pointed the finger at the other acrimoniously. The Muslim League disputed the claim of the Congress to represent all people of India, while the Congress disputed the Muslim League's claim to voice the aspirations of all Muslims. The Civil Disobedience Movement indicated a new part in the process of the Indian self-rule struggle. As a whole, it became a failure by itself, but it brought the Indian population together, under the Indian National Congress's leadership. The movement made the Indian people strive even more towards self-rule. The movement allowed the Indian community to revive their inner confidence and strength against the British Government. In addition, the movement weakened the authority of the British and aided in the end of the British Empire in India. Overall, the civil disobedience Movement was an essential achievement in the history of Indian self-rule because it persuaded New Delhi of the role of the masses in self-determination. 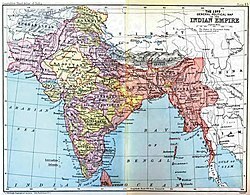 The Government of India Act 1935, the voluminous and final constitutional effort at governing British India, articulated three major goals: establishing a loose federal structure, achieving provincial autonomy, and safeguarding minority interests through separate electorates. The federal provisions, intended to unite princely states and British India at the centre, were not implemented because of ambiguities in safeguarding the existing privileges of princes. In February 1937, however, provincial autonomy became a reality when elections were held; the Congress emerged as the dominant party with a clear majority in five provinces and held an upper hand in two, while the Muslim League performed poorly. In 1939, the Viceroy Linlithgow declared India's entrance into the Second World War without consulting provincial governments. In protest, the Congress asked all of its elected representatives to resign from the government. Muhammad Ali Jinnah, the president of the All-India Muslim League, persuaded participants at the annual Muslim League session at Lahore in 1940 to adopt what later came to be known as the Lahore Resolution, demanding the division of India into two separate sovereign states, one Muslim, the other Hindu; sometimes referred to as Two Nation Theory. Although the idea of Pakistan had been introduced as early as 1930, very few had responded to it. In opposition to the Lahore Resolution, the All India Azad Muslim Conference gathered in Delhi in April 1940 to voice its support for a united India. Its members included several Islamic organisations in India, as well as 1400 nationalist Muslim delegates; the "attendance at the Nationalist meeting was about five times than the attendance at the League meeting." The All-India Muslim League worked to try to silence those Muslims who stood against the partition of India, often using "intimidation and coercion". The murder of the All India Azad Muslim Conference leader Allah Bakhsh Soomro also made it easier for the All-India Muslim League to demand the creation of Pakistan. Bhagat Singh (left), Sukhdev (center), and Rajguru (right) are considered among the most influential revolutionaries of the Indian independence movement. Front page of the Tribune (25 March 1931), reporting the execution of Bhagat Singh, Rajguru and Sukhdev by the British. Apart from a few stray incidents, armed rebellions against the British rulers did not occur before the beginning of the 20th century. The Indian revolutionary underground began gathering momentum through the first decade of the 20th century, with groups arising in Bengal, Maharashtra, Odisha, Bihar, Uttar Pradesh, Punjab, and the Madras Presidency including what is now called South India. More groups were scattered around India. Particularly notable movements arose in Bengal, especially around the Partition of Bengal in 1905, and in Punjab after 1907. In the former case, it was the educated, intelligent and dedicated youth of the urban middle class Bhadralok community that came to form the "classic" Indian revolutionary, while the latter had an immense support base in the rural and Military society of the Punjab. In Bengal, the Anushilan Samiti emerged from conglomerations of local youth groups and gyms (Akhra) in Bengal in 1902, forming two prominent and somewhat independent arms in East and West Bengal identified as Dhaka Anushilan Samiti in Dhaka (modern day Bangladesh), and the Jugantar group (centred at Calcutta) respectively. Led by nationalists of the likes of Aurobindo Ghosh and his brother Barindra Ghosh, the Samiti was influenced by philosophies as diverse as Hindu Shakta philosophy propounded by Bengali literaetuer Bankim and Vivekananda, Italian Nationalism, and Pan-Asianism of Kakuzo Okakura. The Samiti was involved in a number of noted incidences of revolutionary terrorism against British interests and administration in India within the decade of its founding, including early attempts to assassinate Raj officials whilst led by Ghosh brothers. In the meantime, in Maharashtra and Punjab arose similarly militant nationalist feelings. The District Magistrate of Nasik, A.M.T. Jackson was shot dead by Anant Kanhere in December 1909, followed by the death of Robert D'Escourt Ashe at the hands of Vanchi Iyer. [citation not found] Indian nationalism made headway through Indian societies as far as Paris and London. In London India House under the patronage of Shyamji Krishna Verma came under increasing scrutiny for championing and justifying violence in the cause of Indian nationalism, which found in Indian students in Britain and from Indian expatriates in Paris Indian Society avid followers. By 1907, through Indian nationalist Madame Bhikaji Rustom Cama's links to Russian revolutionary Nicholas Safranski, Indian groups including Bengal revolutionaries as well as India House under V.D.Savarkar were able to obtain manuals for manufacturing bombs. India House was also a source of arms and seditious literature that was rapidly distributed in India. In addition to The Indian Sociologist, pamphlets like Bande Mataram and Oh Martyrs! by Savarkar extolled revolutionary violence. Direct influences and incitement from India House were noted in several incidents of political violence, including assassinations, in India at the time. One of the two charges against Savarkar during his trial in Bombay was for abetting the murder of the District Magistrate of Nasik, A.M.T. Jackson, by Anant Kanhere in December 1909. The arms used were directly traced through an Italian courier to India House. Ex-India House residents M.P.T. Acharya and V.V.S. Aiyar were noted in the Rowlatt report to have aided and influenced political assassinations, including the murder of Robert D'Escourt Ashe. The Paris-Safranski link was strongly suggested by French police to be involved in a 1907 attempt in Bengal to derail the train carrying the Lieutenant-Governor Sir Andrew Fraser. The activities of nationalists abroad is believed to have shaken the loyalty of a number of native regiments of the British Indian Army. The assassination of William Hutt Curzon Wyllie in the hands of Madanlal Dhingra was highly publicised and saw increasing surveillance and suppression of Indian nationalism. These were followed by the 1912 attempt on the life of Viceroy of India. Following this, the nucleus of networks formed in India House, the Anushilan Samiti, nationlalists in Punjab, and the nationalism that arose among Indian expatriates and labourers in North America, a different movement began to emerge in the North American Ghadar Party, culminating in the Sedetious conspiracy of World War I led by Rash Behari Bose and Lala Hardayal. However, the emergence of the Gandhian movement slowly began to absorb the different revolutionary groups. The Bengal Samiti moved away from its philosophy of violence in the 1920s, when a number of its members identified closely with the Congress and Gandhian non-violent movement. Revolutionary nationalist violence saw a resurgence after the collapse of Gandhian Non-cooperation movement in 1922. In Bengal, this saw reorganisation of groups linked to the Samiti under the leadership of Surya Sen and Hem Chandra Kanungo. A spate of violence led up to enactment of the Bengal Criminal Law Amendment in the early 1920s, which recalled the powers of incarceration and detention of the Defence of India Act. In north India, remnants of Punjab and Bengalee revolutionary organisations reorganised, notably under Sachindranath Sanyal, founding the Hindustan Republican Association with Chandrashekhar Azad in north India. The HSRA had strong influences from leftist ideologies. Hindustan Socialist Republican Association (HSRA) was formed under the leadership of Chandrasekhar Azad. Kakori train robbery was done largely by the members of HSRA. A number of Congress leaders from Bengal, especially Subhash Chandra Bose, were accused by the British Government of having links with and allowing patronage to the revolutionary organisations during this time. The violence and radical philosophy revived in the 1930s, when revolutionaries of the Samiti and the HSRA were involved in was involved in the Chittagong armoury raid and the Kakori conspiracy and other attempts against the administration in British India and Raj officials. Bhagat Singh and Batukeshwar Dutt threw a bomb inside the Central Legislative Assembly on 8 April 1929 protesting against the passage of the Public Safety Bill and the Trade Disputes Bill while raising slogans of "Inquilab Zindabad", though no one was killed or injured in the bomb incident. Bhagat Singh surrendered after the bombing incident and a trial was conducted. Sukhdev and Rajguru were also arrested by police during search operations after the bombing incident. Following the trial (Central Assembly Bomb Case), Bhagat Singh, Sukhdev and Rajguru were hanged in 1931. Allama Mashriqi founded Khaksar Tehreek in order to direct particularly the Muslims towards the self-rule movement. Some of its members left for the Indian National Congress then led by Subhas Chandra Bose, while others identified more closely with Communism. The Jugantar branch formally dissolved in 1938. On 13 March 1940, Udham Singh shot Michael O'Dwyer(the last political murder outside India), generally held responsible for the Amritsar Massacre, in London. However, the revolutionary movement gradually disseminated into the Gandhian movement. As the political scenario changed in the late 1930s — with the mainstream leaders considering several options offered by the British and with religious politics coming into play — revolutionary activities gradually declined. Many past revolutionaries joined mainstream politics by joining Congress and other parties, especially communist ones, while many of the activists were kept under hold in different jails across the country. Within a short time of its inception, these organisations became the focus of an extensive police and intelligence operations. Operations against Anushilan Samiti saw founding of the Special Branch of Calcutta Police. The intelligence operations against India House saw the founding of the Indian Political Intelligence Office which later grew to be the Intelligence bureau in independent India. Heading the intelligence and missions against Ghadarite movement and India revolutionaries was the MI5(g) section, and at one point involved the Pinkerton's detective agency. Notable officers who led the police and intelligence operations against Indian revolutionaries, or were involved in it, at various time included John Arnold Wallinger, Sir Robert Nathan, Sir Harold Stuart, Vernon Kell, Sir Charles Stevenson-Moore and Sir Charles Tegart, as well as W. Somerset Maugham. The threat posed by the activities of the Samiti in Bengal during World War I, along with the threat of a Ghadarite uprising in Punjab, saw the passage of Defence of India Act 1915. These measures saw the arrest, internment, transportations and execution of a number of revolutionaries linked to the organisation, and was successful in crushing the East Bengal Branch. In the aftermath of the war, the Rowlatt committee recommended extending the Defence of India Act (as the Rowlatt act) to thwart any possible revival of the Samiti in Bengal and the Ghadarite movement in Punjab. In the 1920s, Alluri Sitarama Raju led the ill-fated Rampa Rebellion of 1922–24, during which a band of tribal leaders and other sympathisers fought against the British Raj. Local people referred to him as "Manyam Veerudu" ("Hero of the Jungles"). After the passage of the 1882 Madras Forest Act, its restrictions on the free movement of tribal peoples in the forest prevented them from engaging in their traditional podu (Slash-and-burn) agricultural system, which involved shifting cultivation. Raju started a protest movement in the border areas of the Godavari Agency part of Madras Presidency (present-day Andhra Pradesh). Inspired by the patriotic zeal of revolutionaries in Bengal, Raju raided police stations in and around Chintapalle, Rampachodavaram, Dammanapalli, Krishna-devi-peta, Rajavommangi, Addateegala, Narsipatnam and Annavaram. Raju and his followers stole guns and ammunition and killed several British army officers, including Scott Coward near Dammanapalli. The British campaign lasted for nearly a year from December 1922. Raju was eventually trapped by the British in the forests of Chintapalli then tied to a tree and shot dead with a rifle. The Kallara-Pangode Struggle was one of some 39 agitations against the Government of India. The Home department has later notified about 38 movements/struggles across Indian territories as the ones that culminated in self-rule ended the British Raj. In 1937, provincial elections were held and the Congress came to power in seven of the eleven provinces. This was a strong indicator of the Indian people's support for complete self-rule. When the Second World War started, Viceroy Linlithgow unilaterally declared India a belligerent on the side of Britain, without consulting the elected Indian representatives. In opposition to Linlithgow's action, the entire Congress leadership resigned from the provincial and local governments. The Muslims and Sikhs, by contrast, strongly supported the war effort and gained enormous stature in London. Defying Congress, millions of Indians supported the war effort, and indeed the British Indian Army became the largest volunteer force, numbering 2,500,000 men during the war. Especially during the Battle of Britain in 1940, Gandhi resisted calls for massive civil disobedience movements that came from within as well as outside his party, stating he did not seek India's self-rule out of the ashes of a destroyed Britain. In 1942, the Congress launched the Quit India movement. There was some violence but the Raj cracked down and arrested tens of thousands of Congress leaders, including all the main national and provincial figures. They were not released until the end of the war was in sight in 1945. 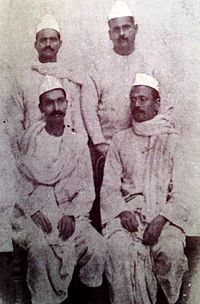 The self-rule movement saw the rise of three movements: The first of these, the Kakori conspiracy (9 August 1925) was led by Indian youth under the leadership of Pandit Ram Prasad Bismil; second was the Azad Hind movement, whose main protagonist Netaji Subhas Chandra Bose was a former leader of Congress. From its earliest wartime inception it joined the Axis Powers to fight Britain. The third conspiracy began in August 1942, orchestrated by Lal Bahadur Shastri it reflected on the common man. The ensuing failure of the Cripps' mission to reach a consensus with the Indian political leadership over the transfer of power after the war revealed the weakness of the socialist position at that time. India's entry into the war was strongly opposed by Subhas Chandra Bose, who had been elected President of the Congress in 1938 and 1939, but later resigned owing to differences of opinion with Gandhi. After resignation he formed his own wing separated from the mainstream congress leadership known as Forward bloc which was a loci focus for ex-congress leaders holding socialist views; however he remained emotionally attached to Congress for the remainder of his life. Bose then founded the All India Forward Bloc. In 1940 the British authorities in Calcutta placed Bose under house arrest. However, he escaped and made his way through Afghanistan to Nazi Germany to seek Hitler and Mussolini's help for raising an army to fight the British. The Free India Legion comprising Erwin Rommel's Indian POWs was formed. After a dramatic decline in Germany's military fortunes, a German land invasion of India became untenable. Hitler advised Bose to go to Japan where a submarine was arranged to transport Bose, who was ferried to Japanese Southeast Asia, where he formed the Azad Hind Government. The Provisional Free Indian Government in exile reorganised the Indian National Army composed of Indian POWs and volunteer Indian expatriates in South-East Asia, with the help of the Japanese. Its aim was to reach India as a fighting force that would build on public resentment to inspire revolt among Indian soldiers raj. Subhas Chandra Bose founded the Indian Legion and revamped the Indian National Army. The INA was to see action against the allies, including the British Indian Army, in the forests of Arakan, Burma and in Assam, laying siege on Imphal and Kohima with the Japanese 15th Army. During the war, the Andaman and Nicobar islands were captured by the Japanese and handed over by them to the INA. The INA failed owing to disrupted logistics, poor supplies from the Japanese, and lack of training. It surrendered unconditionally to the British in Singapore in 1945. Bose, however, attempted to escape to Japanese-held Manchuria in an attempt to escape to the Soviet Union, marking the end of the entire Azad Hind movement. The Quit India Movement (Bharat Chhodo Andolan) or the August Movement was a civil disobedience movement in India which commenced on 8 August 1942 in response to Gandhi's call for immediate self-rule by Indians and against sending Indians to World War II. He asked all teachers to leave their schools, and other Indians to leave their respective jobs and take part in this movement. Due to Gandhi's political influence, his request was followed by a massive proportion of the population. In addition, the INC led the Quit India Movement to demand the British to leave India and to transfer the political power to INC.
During the movement, Gandhi and his followers continued to use non-violence against British rule. This movement was where Gandhi gave his famous message, "Do or Die! ", and this message spread towards the Indian community. In addition, this movement was addressed directly to women as "disciplined soldiers of Indian freedom" and they had to keep the war for independence to go on (against British rule). Procession in Bangalore during the Quit India Movement. At the outbreak of war, the Congress Party had during the Wardha meeting of the working-committee in September 1939, passed a resolution conditionally supporting the fight against fascism, but were rebuffed when they asked for self-rule in return. In March 1942, faced with an increasingly dissatisfied sub-continent only reluctantly participating in the war, and deteriorations in the war situation in Europe and South East Asia, and with growing dissatisfactions among Indian troops- especially in Europe- and among the civilian population in the sub-continent, the British government sent a delegation to India under Stafford Cripps, in what came to be known as the Cripps' Mission. The purpose of the mission was to negotiate with the Indian National Congress a deal to obtain total co-operation during the war, in return of progressive devolution and distribution of power from the crown and the Viceroy to elected Indian legislature. However, the talks failed, having failed to address the key demand of a time-frame towards self-government, and of definition of the powers to be relinquished, essentially portraying an offer of limited dominion-status that was wholly unacceptable to the Indian movement. To force the British Raj to meet its demands and to obtain definitive word on total self-rule, the Congress took the decision to launch the Quit India Movement. The aim of the movement was to force the British Government to the negotiating table by holding the Allied war effort hostage. The call for determined but passive resistance that signified the certitude that Gandhi foresaw for the movement is best described by his call to Do or Die, issued on 8 August at the Gowalia Tank Maidan in Bombay, since renamed August Kranti Maidan (August Revolution Ground). However, almost the entire Congress leadership, and not merely at the national level, was put into confinement less than 24 hours after Gandhi's speech, and the greater number of the Congress khiland were to spend the rest of the war in jail. On 8 August 1942, the Quit India resolution was passed at the Mumbai session of the All India Congress Committee (AICC). The draft proposed that if the British did not accede to the demands, a massive Civil Disobedience would be launched. However, it was an extremely controversial decision. At Gowalia Tank, Mumbai, Gandhi urged Indians to follow a non-violent civil disobedience. Gandhi told the masses to act as citizens of a sovereign nation and not to follow the orders of the British. The British, already alarmed by the advance of the Japanese army to the India–Burma border, responded the next day by imprisoning Gandhi at the Aga Khan Palace in Pune. The Congress Party's Working Committee, or national leadership was arrested all together and imprisoned at the Ahmednagar Fort. They also banned the party altogether. All the major leaders of the INC were arrested and detained. As the masses were leaderless the protest took a violent turn. Large-scale protests and demonstrations were held all over the country. Workers remained absent en masse and strikes were called. The movement also saw widespread acts of sabotage, Indian under-ground organisation carried out bomb attacks on allied supply convoys, government buildings were set on fire, electricity lines were disconnected and transport and communication lines were severed. The disruptions were under control in a few weeks and had little impact on the war effort. The movement soon became a leaderless act of defiance, with a number of acts that deviated from Gandhi's principle of non-violence. In large parts of the country, the local underground organisations took over the movement. However, by 1943, Quit India had petered out. All the other major parties rejected the Quit India plan, and most cooperated closely with the British, as did the princely states, the civil service and the police. The Muslim League supported the Raj and grew rapidly in membership, and in influence with the British. There was opposition to the Quit India Movement from several political quarters who were fighting for Indian self-rule. Hindu nationalist parties like the Hindu Mahasabha openly opposed the call and boycotted the Quit India Movement. Vinayak Damodar Savarkar, the president of the Hindu Mahasabha at that time, even went to the extent of writing a letter titled "Stick to your Posts", in which he instructed Hindu Sabhaites who happened to be "members of municipalities, local bodies, legislatures or those serving in the army...to stick to their posts" across the country, and not to join the Quit India Movement at any cost. The Sangh has scrupulously kept itself within the law, and in particular, has refrained from taking part in the disturbances that broke out in August 1942. Speakers urged the Sangh members to keep aloof from the congress movement and these instructions were generally observed. As such, the British government did not crack down on the RSS and Hindu Mahasabha at all. In 1942 also, there was a strong sentiment in the hearts of many. At that time too, the routine work of the Sangh continued. Sangh decided not to do anything directly. ‘Sangh is the organisation of inactive people, their talks have no substance’ was the opinion uttered not only by outsiders but also our own swayamsevaks. Overall, the Quit India Movement turned out to be not very successful and only lasted until 1943. It drew away from Gandhi's tactic of non-violence; it eventually became a rebellious act without any real leader. After two Japanese attacks on Christmas Island in late February and early March 1942, relations between the British officers and their Indian troops broke down. On the night of 10 March, the Indian troops assisted by Sikh policemen mutinied, killing five British soldiers and imprisoning the remaining 21 Europeans on the island. Later on 31 March, a Japanese fleet arrived at the island and the Indians surrendered. The Royal Indian Navy Mutiny encompasses a total strike and subsequent mutiny by Indian sailors of the Royal Indian revolt on board ship and shore establishments at Bombay (Mumbai) harbour on 18 February 1946. From the initial flashpoint in Bombay, the mutiny spread and found support throughout British India, from Karachi to Calcutta and ultimately came to involve 78 ships, 20 shore establishments and 20,000 sailors. The agitations, mass strikes, demonstrations and consequently support for the mutineers, therefore continued several days even after the mutiny had been called off. Along with this, the assessment may be made that it described in crystal clear terms to the government that the British Indian Armed forces could no longer be universally relied upon for support in crisis, and even more it was more likely itself to be the source of the sparks that would ignite trouble in a country fast slipping out of the scenario of political settlement. WW2 was one of the most significant factors in accelerating the Indian Independence, and the Independence of many British and non-British colonies. In the period of 1945–1965, decolonization led to more than 3 dozen countries getting freedom from their colonial powers. Many factors played in the downfall of the British Empire. Predominantly, the two superpowers that survived WW2 – US and Russia had strong anti-colonial sentiments. When Britain reached out to the US asking for help in the war, US offered help contingent on Britain decolonizing post WW2, and that agreement was codified in the Atlantic charter. The decolonization of Britain (post war) also meant that US and other countries would possibly have access to markets to sell goods that were previously under British Empire-which was not accessible to them then To bring about these changes, the establishment of UN following WW2 codified sovereignty for nations, and encouraged free trade. The war also forced the British to come to an agreement with Indian leaders to grant them freedom if they helped with war efforts since India had one of largest armies. Also, following WW2, it was untenable for British to raise capital on its own to keep its colonies. They needed to rely on America and did via the Marshall Plan to rebuild their country. US and Russia got to draw the picture of how the world will look post war and it was a world where colonialism didn't exist. On 3 June 1947, Viscount Louis Mountbatten, the last British Governor-General of India, announced the partitioning of British India into India and Pakistan. With the speedy passage of the Indian Independence Act 1947, at 11:57 on 14 August 1947 Pakistan was declared a separate nation. Then at 12:02 A.M., on 15 August 1947 India became a sovereign and democratic nation. Eventually 15 August became the Independence Day for India marking the end of British India. Also on 15 August, both Pakistan and India had the right to remain in or remove themselves from the British Commonwealth. But in 1949, India took the decision to remain in the commonwealth. Violent clashes between Hindus, Sikhs and Muslims followed. Prime Minister Nehru and deputy prime minister Sardar Vallabhbhai Patel invited Mountbatten to continue as Governor General of India during the period of transition. He was replaced in June 1948 by Chakravarti Rajagopalachari. Patel took on the responsibility for bringing 565 princely states into the Union of India, steering efforts by his "iron fist in a velvet glove" policies, exemplified by the use of military force to integrate Junagadh and Hyderabad State into India (Operation Polo). On the other hand, Nehru kept the issue of Kashmir in his hands. The Constituent Assembly, headed by the prominent lawyer, reformer and Dalit leader, Dr. B.R. Ambedkar was tasked with creating the constitution of free India. The Constituent Assembly completed the work of drafting the constitution on 26 November 1949; on 26 January 1950, the Republic of India was officially proclaimed. The Constituent Assembly elected Dr. Rajendra Prasad was the first President of India, taking over from Governor General Rajgopalachari. Subsequently, the French ceded Chandernagore in 1951, and Pondichéry and its remaining Indian colonies by 1954. Indian troops invaded and annexed Goa and Portugal's other Indian enclaves in 1961; and Sikkim voted to join the Indian Union in 1975 after the Indian victory over China in Nathu La and Cho La. Following self-rule in 1947, India remained in the Commonwealth of Nations, and relations between the UK and India have since become friendly. There are many areas in which the two countries seek stronger ties for mutual benefit, and there are also strong cultural and social ties between the two nations. The UK has an ethnic Indian population of over 1.6 million. In 2010, Prime Minister David Cameron described Indian – British relations as a "New Special Relationship". ^ The concept had been inspired by the philosophy of Baba Ram Singh (famous for leading the Kuka Movement in the Punjab in 1872). ^ The English colonial empire, including the territories and trading post in Asia, came under British control following the union of England and Scotland in 1707. ^ Khan, Muazzam Hussain. "Titu Mir". Banglapedia. Bangladesh Asiatic Society. Retrieved 4 March 2014. ^ "East India Company – Definition, History, & Facts". Encyclopædia Britannica. ^ "Remembering Queen Velu Nachiyar of Sivagangai, the first queen to fight the British". The News Minute. 3 January 2017. ^ "Velu Nachiyar, Jhansi Rani of Tamil Nadu". The Times of India. 17 March 2016. ^ "Legends from South". Archived from the original on 4 September 2012. ^ Yang, Anand A. (November 2007). "Bandits and Kings: Moral Authority and Resistance in Early Colonial India". The Journal of Asian Studies. 66 (4): 881–896. JSTOR 20203235. ^ K. Guru Rajesh (2015). Sarfarosh: A Naadi Exposition of the Lives of Indian Revolutionaries. Notion Press. p. 65. ISBN 978-93-5206-173-0. ^ "Chinnamalai, a lesser-known freedom fighter of Kongu soil". The Hindu. 2 August 2008. ^ Ram Govardhan (2001). Rough with the Smooth. Leadstart publishing. p. 212. ISBN 9789381115619. ^ Mohanty, N.R. (August 2008). "The Oriya Paika Rebellion of 1817" (PDF). Orissa Review: 1–3. Archived from the original (PDF) on 11 November 2013. Retrieved 13 February 2013. ^ a b Paikaray, Braja (February – March 2008). "Khurda Paik Rebellion – The First Independence War of India" (PDF). Orissa Review: 45–50. Archived from the original (PDF) on 22 April 2014. Retrieved 13 February 2013. ^ "Paik Rebellion". Khordha. National Informatics Centre. Retrieved 14 August 2018. ^ "The Uprising of 1857". Library of Congress. Retrieved 10 November 2009. ^ Robert P. O'Kell (2014). Disraeli: The Romance of Politics. U of Toronto Press. pp. 443–44. ISBN 9781442661042. ^ a b Reddy, Krishna, K (2006). General Studies History 4 Upsc Preliminary Examination. Tata McGraw-Hill Publishing. pp. C34. ISBN 978-0-07-060447-6. ^ Wolpert, Stanley (1988). "The Indian National Congress in Nationalist Perspective". In Sisson, Richard; Wolpert, Stanley (eds.). Congress and Indian Nationalism: The Pre-independence Phase. University of California Press. p. 24. ISBN 978-0-520-06041-8. For the most part, however, Muslim India remained either aloof from or distrustful of the Congress and its demands. ^ Ramnath, Maia (2011). Haj to Utopia: How the Ghadar Movement Charted Global Radicalism and Attempted to Overthrow the British Empire. University of California Press. p. 227. ISBN 978-0-520-26955-2. ^ Latif, Asad (2008). India in the Making of Singapore. Singapore: Institute of Southeast Asian Studies. p. 34. ISBN 9789810815394. ^ Blocker, Jack S.; Fahey, David M.; Tyrrell, Ian R. (2003). Alcohol and Temperance in Modern History: An International Encyclopedia. ABC-CLIO. p. 310. ISBN 9781576078334. ^ Guha, Arun Chandra (1971). First Spark of Revolution. Orient Longman. pp. 130–131. OCLC 254043308. They [Khudiram Basu and Prafulla Chaki] threw a bomb on a coach similar to that of Kingsford's ... Khudiram ... was sentenced to death and hanged. ^ Official website, Government of Pakistan. "The Statesman: Jinnah's differences with the Congress". Archived from the original on 27 January 2006. Retrieved 20 April 2006. ^ "The Indian Independence Movement". Retrieved 29 May 2014. ^ Qasmi, Ali Usman; Robb, Megan Eaton (2017). Muslims against the Muslim League: Critiques of the Idea of Pakistan. Cambridge University Press. p. 2. ISBN 9781108621236. ^ Haq, Mushir U. (1970). Muslim politics in modern India, 1857-1947. Meenakshi Prakashan. p. 114. OCLC 136880. This was also reflected in one of the resolutions of the Azad Muslim Conference, an organization which attempted to be representative of all the various nationalist Muslim parties and groups in India. ^ a b Ahmed, Ishtiaq (27 May 2016). "The dissenters". The Friday Times. However, the book is a tribute to the role of one Muslim leader who steadfastly opposed the Partition of India: the Sindhi leader Allah Bakhsh Soomro. Allah Bakhsh belonged to a landed family. He founded the Sindh People’s Party in 1934, which later came to be known as ‘Ittehad’ or ‘Unity Party’. ... Allah Bakhsh was totally opposed to the Muslim League’s demand for the creation of Pakistan through a division of India on a religious basis. Consequently, he established the Azad Muslim Conference. In its Delhi session held during April 27–30, 1940 some 1400 delegates took part. They belonged mainly to the lower castes and working class. The famous scholar of Indian Islam, Wilfred Cantwell Smith, feels that the delegates represented a ‘majority of India’s Muslims’. Among those who attended the conference were representatives of many Islamic theologians and women also took part in the deliberations ... Shamsul Islam argues that the All-India Muslim League at times used intimidation and coercion to silence any opposition among Muslims to its demand for Partition. He calls such tactics of the Muslim League as a ‘Reign of Terror’. He gives examples from all over India including the NWFP where the Khudai Khidmatgars remain opposed to the Partition of India. ^ a b c Ali, Afsar (17 July 2017). "Partition of India and Patriotism of Indian Muslims". The Milli Gazette. ^ K̲h̲ān, Lāl (2007). Crisis in the Indian Subcontinent, Partition: Can it be Undone?. Aakar Books. ISBN 9788189833107. ^ Hopkirk 1994, p. 46 [By 1909] India House was beginning to come under suspicion ... too late to save Sir William Curzon Wyllie from the assassin's pistol ... Savarkar could see that London was rapidly becoming too hot for him ... In early January 1910, therefore, he slipped quietly over to Paris, determined to make it his new revolutionary headquarters ... [police] managed to obtain evidence linking him with the smuggling of firearms into India. ^ Majumdar 1966, p. 147 Savarkar's Bande Mataram contained exhortations [advocating terrorism] ... This sort of propaganda produced the natural effect. A. M. T. Jackson, the Magistrate ... was shot dead on the 21st of December 1909 ... charges against him [Savarkar] included the sending of pistols and seditious pamphlets to India. Another charge was that in 1908 he with the help of residents in the India House manifolded in type a number of copies of a work describing minutely the manner of preparing explosives and bombs. He despatched these copies to various addresses in India. ^ "Dhingra, Madan Lal. Oxford Dictionary of National Biography". Oxford University Press. 2004. doi:10.1093/ref:odnb/71628. Retrieved 29 October 2015. ^ a b Balakrishna, V.G. "Freedom Movement in Andhra Pradesh". Government of India Press Information Bureau. Retrieved 28 March 2011. ^ Roy, Kaushik (2009). "Military Loyalty in the Colonial Context: A Case Study of the Indian Army during World War II". Journal of Military History. 73 (2): 144–172. ^ "Forgotten armies of the East – Le Monde diplomatique – English edition". Mondediplo.com. 10 May 2005. Retrieved 14 June 2012. ^ "The Congress and The Freedom Movement". Indian National Congress. Archived from the original on 11 August 2007. Retrieved 24 September 2007. ^ a b Prabhu Bapu (2013). Hindu Mahasabha in Colonial North India, 1915–1930: Constructing Nation and History. Routledge. pp. 103–. ISBN 978-0-415-67165-1. ^ Sekhara Bandyopadhyaya (2004). From Plassey to Partition: A History of Modern India. Orient Blackswan. p. 422. ISBN 978-81-250-2596-2. ^ Shamsul Islam (2006). Religious Dimensions of Indian Nationalism: A Study of RSS. Media House. pp. 187–. ISBN 978-81-7495-236-3. ^ "Christmas Island History". Christmas Island Tourism Association. Archived from the original on 8 December 2014. Retrieved 9 December 2014. ^ "Milestones: 1945–1952 – Office of the Historian". ^ William Roger Louis, Imperialism at Bay: The United States and the Decolonization of the British Empire, 1941–1945 (1978). ^ "BBC – History – British History in depth: Britain, the Commonwealth and the End of Empire". ^ Nelson, Dean (7 July 2010). "Ministers to build a new 'special relationship' with India". The Daily Telegraph. Bose, Nirmal (October – December 1985). "Subhas Chandra Bose and the Indian National Congress". Indian Journal of Political Science. 46 (4): 438–450. JSTOR 41855198. Chandra, Bipan (2008). Communalism in Modern India. Har-Anand. pp. 140–. ISBN 978-81-241-1416-2. Collett, Nigel (2005). The Butcher of Amritsar: General Reginald Dyer. Hambledon Continuum. ISBN 978-1-85285-457-7. David, Saul (2002). The Indian Mutiny: 1857. Viking. p. 122. ISBN 978-0-670-91137-0. Fischer-Tiné, Harald; Tschurenev, Jana, eds. (2014). A History of Alcohol and Drugs in Modern South Asia: Intoxicating Affairs. Taylor & Francis. pp. 255–257. ISBN 978-1-317-91681-9. Fraser, Thomas G. (April 1977). "Germany and Indian Revolution, 1914-18". Journal of Contemporary History. 12 (2): 255–272. doi:10.1177/002200947701200203. JSTOR 260216. Gupta, Amit Kumar (September – October 1997). "Defying Death: Nationalist Revolutionism in India, 1897-1938". Social Scientist. 25 (9/10): 3–27. doi:10.2307/3517678. JSTOR 3517678. Heehs, Peter (1998). India's Freedom Struggle: A Short History. Delhi: Oxford University Press. p. 199. ISBN 978-0-19-562798-5. Hopkirk, Peter (1994). On Secret Service East of Constantinope. John Murray. ISBN 978-0-7195-5017-1. Jalal, Ayesha (1994). The Sole Spokesman: Jinnah, the Muslim League and the Demand for Pakistan. Cambridge University Press. ISBN 978-0-521-45850-4. Lahiri, Shompa (2000). Indians in Britain: Anglo-Indian Encounters, Race and Identity, 1880–1930. Psychology Press. ISBN 978-0-7146-4986-3. Lloyd, Nick (2011). The Amritsar Massacre: The Untold Story of One Fateful Day. I.B. Tauris. ISBN 978-1-84885-723-0. Majumdar, Bimanbehari (1966). Militant nationalism in India and its socio-religious background (1897-1917). General Printers & Publishers. OCLC 8793353. Mitra, Subrata K. (July 1997). "Nehru's policy towards Kashmir: Bringing politics back in again". Journal of Commonwealth & Comparative Politics. 35 (2): 55–74. doi:10.1080/14662049708447745. Patel, Hitendra (2008). Khudiram Bose: Revolutionary Extraordinaire. New Delhi: Publications Division, Ministry of Information and Broadcasting, Govt. of India. ISBN 978-81-230-2278-9. Popplewell, Richard James (1995). Intelligence and Imperial Defence: British Intelligence and the Defence of the Indian Empire, 1904-1924. London: Frank Cass. ISBN 978-0-7146-4580-3. Puniyani, Ram (2005). Religion, Power and Violence: Expression of Politics in Contemporary Times. SAGE Publications. pp. 134–. ISBN 978-0-7619-3338-0. Brown, Judith M. (1972). Gandhi's Rise to Power: Indian Politics 1915–1922. Cambridge South Asian Studies. Cambridge University Press. ISBN 978-0-521-08353-9. Brown, Judith M. (2009). "Gandhi and Civil Resistance in India, 1917–47". In Roberts, Adam; Ash, Timothy Garton (eds.). Civil Resistance and Power Politics: The Experience of Non-violent Action from Gandhi to the Present. Oxford University Press. ISBN 978-0-19-955201-6. Brown, Theodore (January 2008). "Spinning for India's Independence". Am J Public Health. 98 (1): 39. doi:10.2105/AJPH.2007.120139. PMC 2156064. PMID 18048775. Gandhi, Mohandas (1993). An Autobiography: The Story of My Experiments With Truth. Boston: Beacon Press. ISBN 978-0-8070-5909-8. Gonsalves, Peter (2012). Khadi: Gandhi's Mega Symbol of Subversion. Sage Publications. ISBN 9788132107354. Gopal, Sarvepalli (1975). Jawaharlal Nehru: A Biography. Volume One: 1889 – 1947. Johnathan Cape. ISBN 978-0-224-01029-0. Majumdar, R. C. (1988) [First published 1962]. History of the Freedom movement in India. South Asia Books. ISBN 978-0-8364-2376-1. Sarkar, Sumit (1983). Modern India: 1885–1947. Madras: Macmillan. p. 486. ISBN 978-0-333-90425-1. Seal, Anil (2007) [First published 1968]. Emergence of Indian Nationalism: Competition and Collaboration in the Later Nineteenth Century. London: Cambridge University Press. ISBN 978-0-521-06274-9. Singh, Jaswant (2009). Jinnah: India, Partition, Independence. Rupa & Co. ISBN 9788129113788. Sofri, Gianni (1995–1999). Gandhi and India: A Century in Focus. Janet Sethre Paxia (translator) (English edition translated from the Italian ed.). Gloucestershire: The Windrush Press. ISBN 978-1-900624-12-1. Wolpert, Stanley A. (1984). Jinnah of Pakistan. Oxford University Press. ISBN 978-0-19-503412-7. Wolpert, Stanley A. (2001). Gandhi's Passion: The Life and Legacy of Mahatma Gandhi. Oxford University Press. ISBN 978-0-19-513060-7.